While there is hardly any drink that can rival a good purified glass of H2O [water], there is another natural beverage that has been known to not only quench excessive thirst caused by high blood pressure but also provide other healing properties to the body. The beverage is coconut water. Drained from the coconut fruit which is known to have many uses, the delicious water is said to be laden with potassium, a mineral and electrolyte that has the potential to counteract the effects of sodium in the body thereby helping to maintain consistent blood pressure. Potassium is also useful to regulate the water and acid-base balance in the blood and tissues. Although it has been proven that a person consuming a balanced diet will have sufficient potassium in their body, there are many people who fail to achieve this goal on a daily basis. It is for just such persons that the use of coconut water can come in especially handy. So whenever you drink a glass of coconut water you should be able to do so with a smile since it doesn’t only provide the tongue with a mesmerizing and refreshing taste but it can also help to improve your overall health. According to medical experts, enough potassium in the body can, among other things, help to reduce the risk of high blood pressure, heart disease and even stroke. Many foods such as leafy vegetables, fish such as salmon, as well as bananas, plantains and sweet potatoes also contain potassium, and the tasty coconut water can help to complement these. But as the old saying suggests, too much of a good thing can prove to be bad. You see, the body can only handle so much potassium in a single day thus medical experts have cautioned that persons should seek to limit their intake to between 3,500 to 4,700 milligram per day. This therefore means excess coconut water consumption in addition to other potassium filled foods could result in adverse effects to the body ranging from low blood pressure to irregular heart rhythm which left unaddressed can lead to death. So when indulging in the tasty coconut beverage take into consideration the make-up of your daily diet. Should the need be evident after such consideration, getting access to coconut water to augment your potassium intake is certainly not a difficult task. Serving up this beverage on a daily basis is a couple – Anthony and Safeena Khan – that hails from the East Coast of Demerara. The parents to two teenage girls, this couple has for the past five years been vending coconut at Ruimveldt, Georgetown. If you are heading to central Georgetown, just pass the Ruimveldt Police Station, their coconut cart is easy to notice on the eastern side of the thoroughfare. Selling coconut can barely pay their bills but providing coconut water and sometimes its jelly to their customers is nothing but a labour of love. They don’t profess to know the specific health benefits of coconut water but they both have an appreciation for its importance as they have used it themselves over the years and are convinced that it has innumerable health benefits which they are bent on sharing with others. “People keep coming back for more so even if we wanted to stop selling it we have people who depend on us for their coconut water,” a smiling Safeena told the Guyana Standard. According to Anthony, although the trade is not a very lucrative one, he grew up seeing his father selling coconut water and so it came naturally to him to continue this family legacy. This usually entails Anthony skillfully chopping an opening in the coconut after which Safeena funnels its content into a bottle or a container of the customer’s preference. However, there are times when the roles are reversed and she is able to showcase that she too has what it takes to make this precious life-saving, naturally made beverage flow much to the enjoyment of those who seek after it. 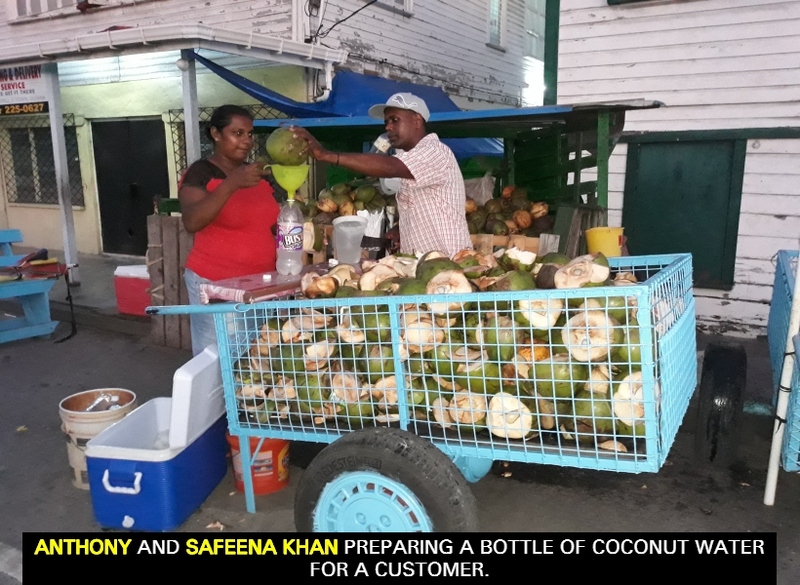 So next time you feel the urge for a refreshing sip, you can head down to the Khan’s coconut cart at Ruimveldt, or wherever you can find a coconut water vendor, and take advantage of a service designed to cater to your coconut water need.